Secretary of the Interior Ryan Zinke announced Thursday he will not recommend the removal of any national monuments, assuaging the fears of some opponents who warned that vast public lands and marine areas could be stripped of federal protection. Zinke is recommending changes to a "handful" of the monuments following a review of public lands. He will seek to change some boundaries and possibly open up drilling, mining, or other industries on some federal land, the Associated Press reported. The monuments Zinke reviewed included large tracts of public lands, 100,000 acres or more in size. The review came in response to an executive order issued by President Donald Trump in April that instructed Zinke to review lands designated as national monuments by the Clinton and Obama administrations under the century-old Antiquities Act. Trump had referred to those designations as a "massive federal land grab." The administration argued the act had been misused by presidents to create oversized monuments that hinder energy development, grazing, and other uses. The review examined whether the federal lands should be eliminated, downsized, or otherwise altered. Zinke's recommendations are now in the hands of the White House, which told the AP only that it was reviewing the recommendations. Many environmentalists and conservationists were wary of Trump's initial executive order, and may be calmed by Zinke's recommendation to leave the monuments in place. However, some remain concerned about Zinke's proposed resizing. The uncertainty in Zinke's initial announcement has some conservationists and tribal leaders alarmed. 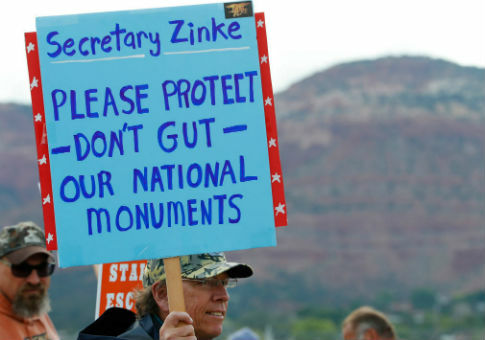 They are demanding the full release of Zinke's recommendations and say they will oppose efforts to shrink any monuments. "A change can be a small tweak or near annihilation. The public has a right to know," said Jacqueline Savitz, senior vice president of the conservation group Oceana. Some environmental groups contend that the Antiquities Act only empowers the president to designate new monuments, leaving the power to alter those monuments to Congress. Another debated question is whether designated monuments could legally be opened for energy development, mining, or other industries. Zinke did not comment on whether any monuments would be newly opened for those purposes. He instead focused on the importance of maintaining access for "traditional uses," including hunting, fishing, and grazing. "There's an expectation we need to look out 100 years from now to keep the public land experience alive in this country," he said. "You can protect the monument by keeping public access to traditional uses." Zinke made clear that public access for fishing, hunting, and grazing would be maintained or restored, and spoke to tribal interests. More than anything, he pushed back against conservationists' claims that the Trump administration was planning to sell-off or otherwise privatize federal lands. Zinke had previously announced that no changes would be made to monuments in Montana, Colorado, Idaho, California, Arizona, and Washington. He also recommended at the time that Bears Ears national monument in Utah be downsized. A tribal coalition strongly opposes any changes to the Bears Ears land, however, and state Rep. Mike Noel (R.) has pushed to fully rescind the designation as a monument. Noel said he could "live with" only a rollback of Bears Ears' boundaries. This entry was posted in Politics and tagged Department of the Interior, National Park Service, Utah. Bookmark the permalink.